We're not skilled with tools, but we're motivated and are willing to learn throughout the process. Let's see how it will work out!! 2- Installed the Maxxair Fan. See our post here. 3- Installed 2x 160W solar panels using 3M VHB tape. See our post here. 4- Install passenger swivel seat. See our post here. 5- Install Fiamma F45 awning. See our post here. 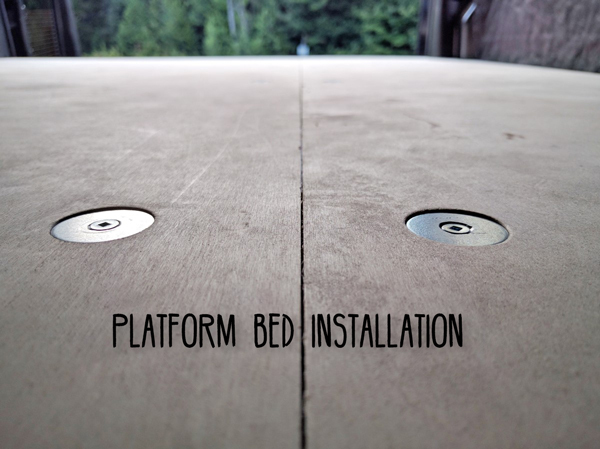 6- Install insulated Floor. See our post here. 7- Install Webasto air heater. See our post here. 8- Install Thinsulate noise & thermal insulation. See our post here. 9- This is how we avoid drilling holes in the van: PLUSNUT! See our post here. I like your sliding bike rack. We went for a fixed installation of our solar panels (they cannot be tilted); since we don’t spend much time at the same location when travelling, we decided it was not worth the trouble (and added weight) to make our solar panels tilt. Very cool build and informative website. I especially appreciate the step-by-step documentation... something I often forgot to do while I was completing my build. Phranc, your build is next level! So many well thought details and it look very professional. Good job! We wanted a permanent raised bed above the "garage" (over the mountain bikes and other equipment); no need to fold/unfold the bed at night & it creates a lot of storage room. A campervan conversion for Mountain-Biking deserve proper mountain-bike rack! We wanted the bikes to be stored inside the van & to be easily loaded/unloaded. The tray extend 48" and locks fully in or out position.